One of the most challenging obstacles to diagnostic providers getting paid on time for their services is a lack of accurate patient data. Many laboratories struggle with the quality of the data that they receive and because they often lack direct access to the patients, it can be an expensive, manual process for lab team members to chase down incomplete, incorrect, or missing data that is required for claim reimbursement. Cleaning up and filling in missing or erroneous data is not, however, a step in the claims handling process that can be skipped. It must be done to avoid slowing the downstream reimbursement process. That’s why XIFIN takes data quality so seriously. We know that automating the correction and completion of patient and insurance data upfront is the key to both unencumbering the downstream reimbursement process and freeing up valuable staff time to focus on more important activities. This integrated data quality automation is also coordinated with patient and client correspondence, which can further streamline the entire revenue cycle management process. FrontRunnerHC uses a variety of data sources and applied advanced analytics to match patient records with both real-time insurance discovery and patient demographic data. The automated insurance discovery capabilities search multiple databases for current coverage information. Dara errors, whether demographic or coverage-relayed are also identified automatically. Missing or incorrect data can then be updated automatically with correct, complete data or the laboratory client may choose to route the new information to a team member to approve prior to updating. Either way, the result is a higher impact reimbursement solution that automatically identifies and fixes data errors for laboratory customers. With XIFIN RPM labs can identify active insurance coverage, increase clean claim rates, and generate more revenue—all while reducing accounts receivable and rework costs. 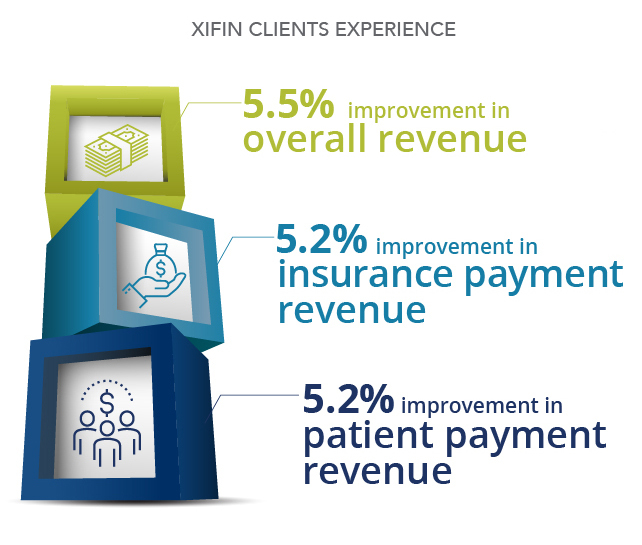 XIFIN clients are measuring the success of this integrated data quality focus by tracking the reduction in denial rates as well as the increase in cash collected from self-pay accounts.